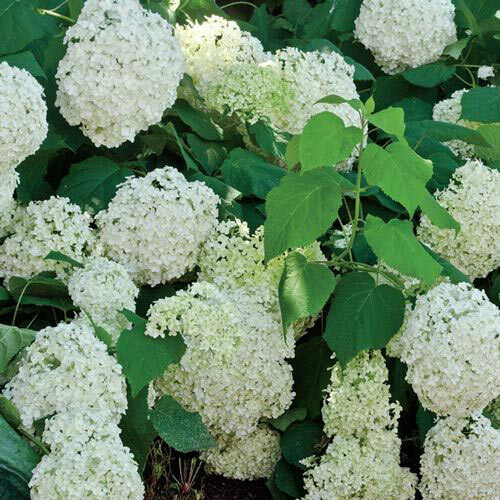 Snowball Bush | Gurney's Seed & Nursery Co.
An impressive addition to the landscape, this shrub produces masses of pure white, snowball-like clusters of blooms that slowly fade to gentle shades of pink. Blooms in late spring to early summer. Its soft green leaves turn red-orange and purple in fall. Grows 8- to 12-ft. tall, but can be cut back to control size. Plant in full sun to partial shade. Zones 3-7. Potted. Flower FormLarge white pompoms flowers in spring that slowly fade to gentle shades of pink with age. These flowers are sterile and do not form the bright red fruits typical of the species. Growth RateSlow to establish but overall fast grower. PruningCan be cut back every three to four years to 2-3' to control size if necessary, although bloom for the following year will be lost. Otherwise just prune as need to remove spent bloom clusters, dead/damaged branches, suckers and to thin out overcrowded branches. CommentsGorgeous display of snowball-like blooms and attractive foliage. DepthPlace the plant in the hole at the same level it was grown by the nursery. This is where the roots start and the tops shoots begin. Spread the roots out evenly. Gently work the soil around the roots do not pack the soil. Water plant thoroughly.